Hakan Andersson (above), gave Yamaha their first MX title back in 1973. He is surely remembered as a 250 rider but back in the early 1970s he also used a 360 version of Yamaha’s factory 250cc bike. 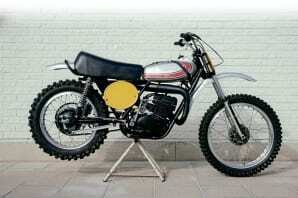 This is the story of Hakan’s former Yamaha YZ360 from 1972. Erik Stenlund is a double champ. A fact that might puzzle many readers of CDB, at least the ones who feel they are reasonably familiar with classic MX heroes from Sweden. They know the likes of Sten Lundin and Hakan Carlqvist. But Erik Stenlund? Erik lives in Uppsala, a prominent town north of Stockholm in a part of Sweden known as Uppland. The area has fostered many MX stars, Bill Nilsson and surely the most well known Torsten Hallman. Although Erik started his career as a motorcycle racer on a MX track, he later went on to spend most of his active years on speedway ovals. Oddly his main fame and two world champion titles came neither in MX nor in speedway, but in ice racing.